Quiltville's Quips & Snips!! : Class Day in Ketchikan–Cathedral Stars! 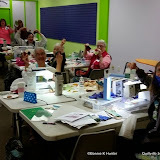 It’s really nice to spend time long enough in one place that I get to know the ladies….even more than the fabric, the notions, the machines, the quilts ---it’s all about RELATIONSHIPS and I firmly believe the relationships we form with other quilters are the longest lasting and deepest meaning of all. They “get” us! Other quilters “understand” us! One gal runs across the mall to purhase some more neutrals, comes back, shows them around…and pretty soon 3 more disappear to go buy more neutrals too..Hahahaha! And it’s all good! Cathedral Stars is such a great quilt for learning some fine tuning piecing tricks, to learn and master a couple of specialty rulers that I just love and can’t live without, to play with color and value and variety. I also love the varied projects that students envision themselves – it is so great to watch their own projects take shape as reflections of their own personalities and dreams for where they want their quilt to go. This is one of the reasons I don’t teach from kits. You don’t learn much if all 24 students are sewing the same thing, already matched for them. They don’t learn how to make the best use of the fabric they already have on hand at home ---and they aren’t inspired by what someone else is doing, learning from those around them for quilts they might want to make in the future as far as fabric and color choices go. Before I show you the slide show of class photos….take a look at Alyce’s Scrap Challenge! The guild issued a scrap challenge, and Alyce assembled much of this wonderful quilt with 3 sizes of half-square triangles as Leaders & Enders in between the lines of other piecing. Isn’t it wonderful? Of course we all commented on how nicely she matches the color of the walls in the store front we are using as our classroom this weekend. Thanks for bringing your quilt in to inspire us all, Alyce! You will find the free pattern for Cathedral Stars under the Free Patterns tab at the top of the blog. Little shady and back lit, but still glorious! The weather has been INCREDIBLE for Ketchikan in September. And today looks like another great one! Class starts at noon, and a group is gathering at 10am for brunch before we head over for our last teaching day. Class goes from 12-6pm, the last flight out that I could catch today is 6:30pm, and there is no way to make that flight, so I have tomorrow to explore before heading out on that red-eye flight to Buffalo, NY where I’ll be with the Amherst Museum Quilters in Amherst, NY next week! It is amazing how different this quilt design looks done in different colour ways. Some lovely fabrics and colour choices. No wonder you enjoy seeing what your students create, Bonnie. Enjoy your sightseeing tomorrow. Safe journey. I keep telling everyone that after our Alaskan cruise, this is the one place I'd definitely return too. Your pictures are really solidifying that point to me. Amazed at what people get done at retreats, the triangle quilt is drop dead gorgeous. can't wait to see you in Buffalo! Bonnie I really enjoy the way you allow us followers to feel like we are travelling with you. For those of us that will never have the opportunity to travel to all these beautiful places, the wonderful photos you post put us there with you. I can't wait until 2016 when you come and visit us 'down under'. Enjoy the rest of your trip, the forging of new friendships and safe travels home. Hey Bonnie, I think the caption on your sunset photo describes you perfectly..."a little shady...but still glorious!" Your blog is a treat, thanks for reminding us how much fun life can be. They are all just beautiful, I love all the color combinations and how they each have their own personality. A wonderful explanation of why you don't teach with kits. I love to see the variety of fabric choices, when all are using the same pattern.